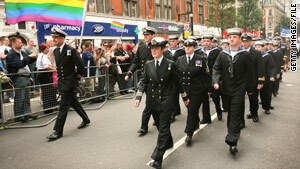 Military personnel take part in a Gay Pride parade in London. A British officer says integrating gays was not a problem. Washington (CNN) -- The U.S. and its military allies agree on many things, from the size of bullets for their rifles to the design of future fighter jets. But on the issue of gays in the military, the United States stands alone among its Western allies. Representatives from Great Britain, Canada, Australia, Israel and the Netherlands gathered Wednesday at the Brookings Institution, a think tank in Washington, to describe how the militaries in those countries handled allowing homosexuals to serve openly. The consensus was that, in spite of concerns before the change, it became a nonissue once gays and lesbians were allowed to serve. "I did not see one case at any level when homosexuals did not get along with other soldiers. The problems are among men and women," said Maj. Gen. Walter Semianiw, an infantry officer in the Canadian military. "This is not an issue for our country." "We know the U.S. as a country that favors the individual rights, freedom, giving the people the opportunity to flourish in their life," said Col. Kees Matthijssen of the Royal Dutch Army. "From that perspective it's still very strange the U.S. is still having a kind of ban on openly having gays and lesbians in the military." "There were concerns in the late '90s of gay men walking across the gangplank in feather boas and high heels," said retired Lt. Cmdr. Craig Jones of the British Royal Navy. "That just did not happen." Jones said British military officials saw an unexpected benefit of allowing gays to serve openly -- better retention of qualified soldiers and sailors in key positions. In the late 1990s and early 2000s, the British military had a 6 percent to 8 percent gap in unfilled positions. Now it's down to the 2 percent to 3 percent range. Jones said one reason for that is the new policy allowing gays to serve. Now that gays are able to serve, military recruiters in the United Kingdom have more volunteers to choose from, Jones said. Also, having children is often cited by British troops as one reason why they leave the military in their late 20s or 30s. Jones said because gays and lesbians are less likely to become parents, they tend to stay in the military longer. During a recent congressional hearing on the U.S. military's "don't ask, don't tell," policy, retired NATO Commander Gen. John Sheehan testified that he believed the Dutch military's policy of allowing gays to serve was in part to blame for the Dutch military's failure to halt the massacre of Muslims in the Bosnian town of Srebrenica in 1995. Sheehan later backtracked on his testimony, but Matthijssen of the Dutch army addressed the comments. "I was in Srebrenica myself, I was a company commander, I was there. I had a full professional company," Matthijssen said. "The homosexual, sexuality that he suggested would have affected that unit, that is absolutely not the case." Matthijssen said, "There was good cohesion within the unit, the unit was effective. But the unit was put in a place -- based on political decisions within the U.N., within the international community -- with too [few] troops, too few means, not the mandate to really fight and overwhelm ... That's what really happened." Matthijssen said allowing gays to serve openly has made the Royal Dutch Army better. "We're much more effective because we have an organizational culture and climate that people know that they can tell about who they are, and that's what we encourage," he said.